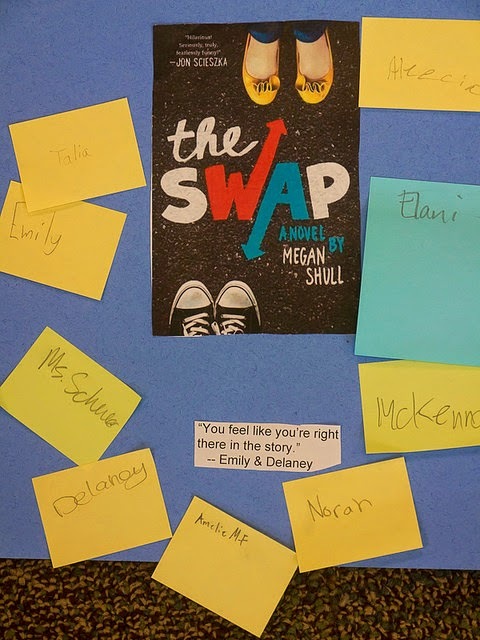 2015 Mock Newbery discussions at Emerson, part 7: OUR WINNERS! + GIVEAWAY!!! It's been an exciting journey with our students, reading and discussing what they think the most distinguished books for children have been in 2014. My students know their voices and opinions are valued--and that's made a huge difference to them. But even more than that, they've had a great time sharing their ideas with each other. As a special celebration, I'm hosting a giveaway of one of these titles of your choosing. Please see below for full details! The winner for the 2015 Mock Newbery at Emerson School is The Crossover, by Kwame Alexander. Will any of these win the 2015 Newbery Medal? We'll all find out on Monday, February 2nd when the winners are announced in Chicago at the American Library Association Midwinter Meeting. You can follow the live webcast here early Monday morning. I'll be spending the weekend with my library "book friends", talking about favorite books we've read and new books we're looking forward reading this year. These four special books will certainly be ones I'll be sharing--because my students' excitement is contagious! Giveaway ends Thursday 2/5 at 12am Pacific. Winners must be to the United States shipping address. Kids & parents may enter, and present the gift to a teacher or school library. I want to give a special thanks to all the publishers who supported our book club by sending review copies. It made our small adventure possible. If you make a purchase using the Amazon links on this site, a small portion goes to Great Kid Books. Thank you for your support. 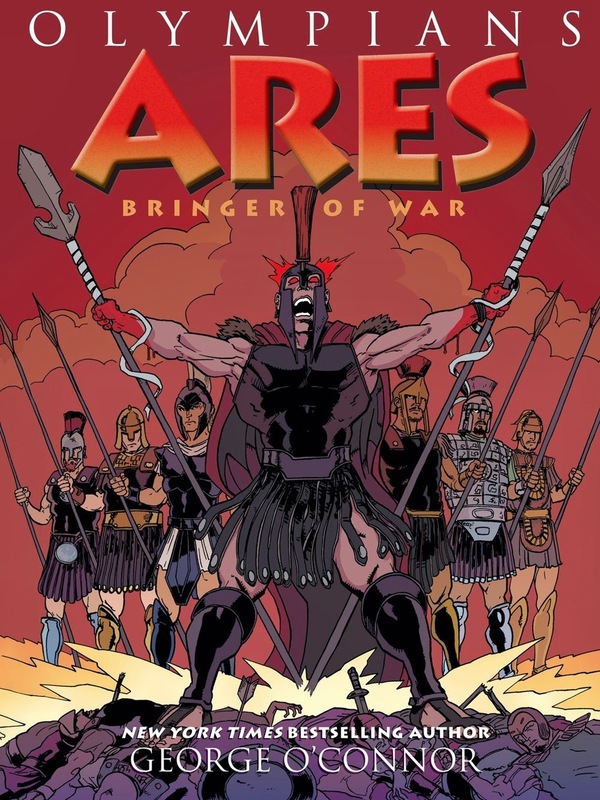 Today I'm celebrating the release of Ares: Bringer of War, the latest graphic novel by George O'Connor in his outstanding Olympians series. This entire series is terrific and very popular with my students. They're going to be thrilled to see this newest installment. The mighty Ares is the Greek god of war, consumed by rage, hate and vengeance. His war is destructive, frenzied and maniacal. And as O'Connor clearly shows, you can only really understand Ares in contrast to his half-sister Athena, goddess of the strategic, logical side of war. "The cost has been high for both sides. But much that is fated to occur has not happened yet. We may need to take a more active hand." But the gods incessantly argue and take sides, playing the mortals against one another like a chess game. As O'Connor shows, Ares is blood-thirsty, but he is also loyal and determined, and he truly mourns the loss of his son in the end. 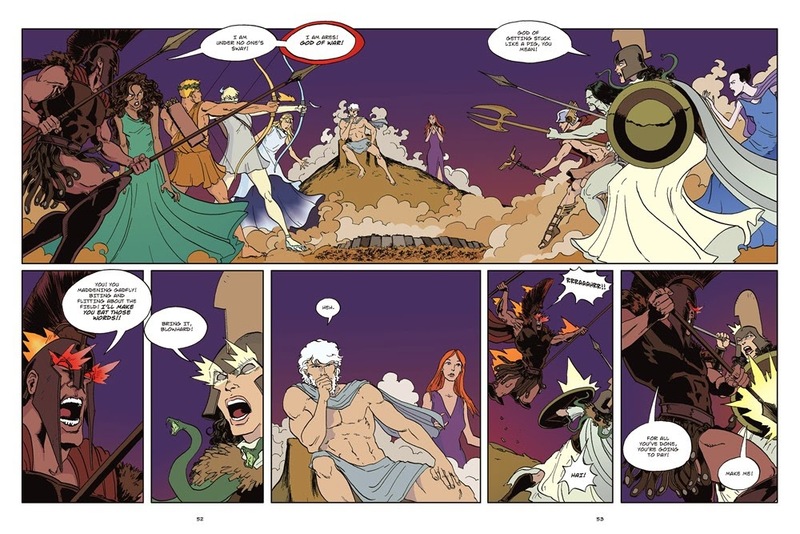 Readers will be amazed by the artwork, but also by the complicated interactions between all the gods. Ares: Bringer of War feels even more complex than previous Olympians books because there is one whole story arc, involving gods and mortals. Previous books seemed more episodic to me, so easier to digest in smaller chunks. Complicated? Yes, but I've been drawn back to this graphic novel again and again, reading it perhaps four times this week. With each reading, my understanding grows--and I've watched the same thing happen with my students. 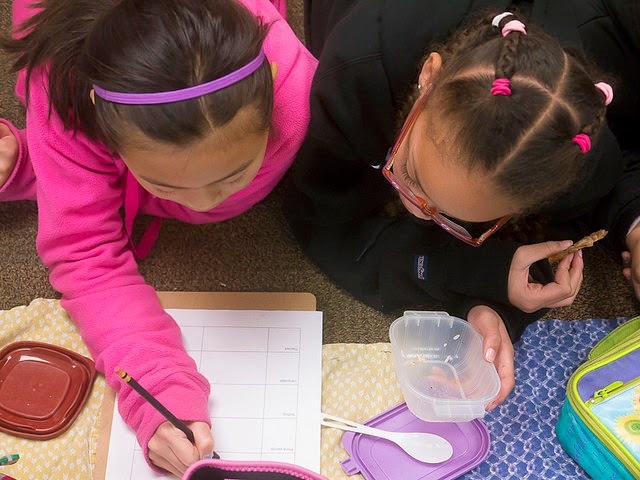 They read the same graphic novel over and over, noticing more details each time, understanding the characters more fully with repeated readings. For other stops on the Blog Tour, check out MacTeenBooks. Definitely suggest The Olympians website as a resource for fans -- it's full of information on the gods and O'Connor's research, as well as links and activities. The review copy was kindly sent by the publishers, First Second Books. If you make a purchase using the Amazon links on this site, a small portion goes to Great Kid Books. Thank you for your support. 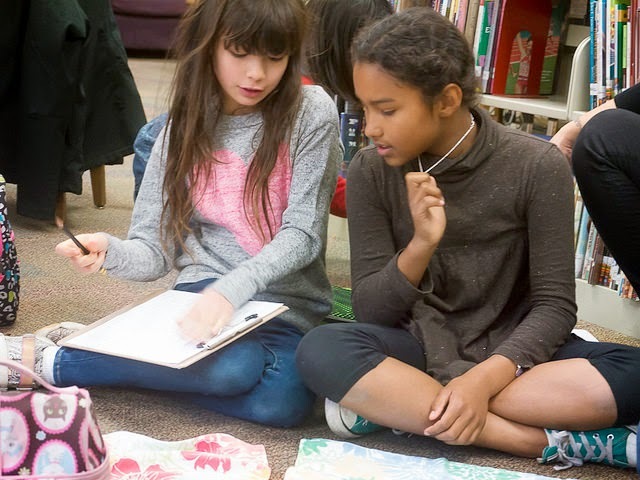 When our students look back on our Mock Newbery discussions from this year, they will see parts of themselves in the books they loved and championed. Each book appealed to different readers -- and that's something the Newbery committee wrestles with as well. How do you clearly evaluate the art while acknowledging the personal response? 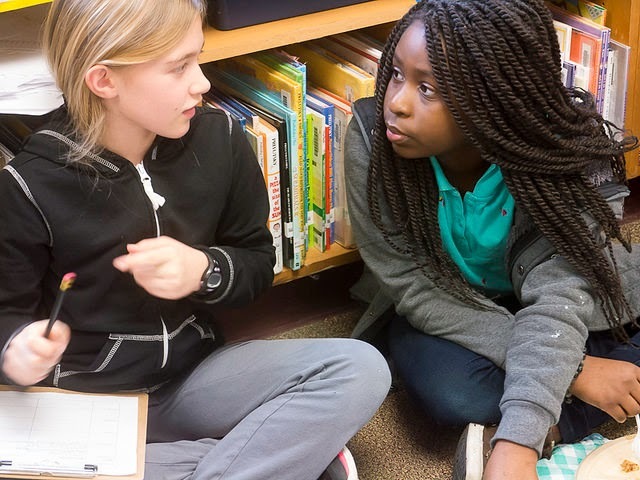 Our discussions just started to dig into this topic, but they helped students listen to each other and consider all that goes into selecting the ultimate award-winning books. Ellie and Jack might look like they each have everything going for them, but they're each struggling on the inside. When they bump into each other on the first day of school and magically switch bodies, they're forced to see life from a different perspective. While the premise might seem familiar to adults, my students found it compelling and well-written. 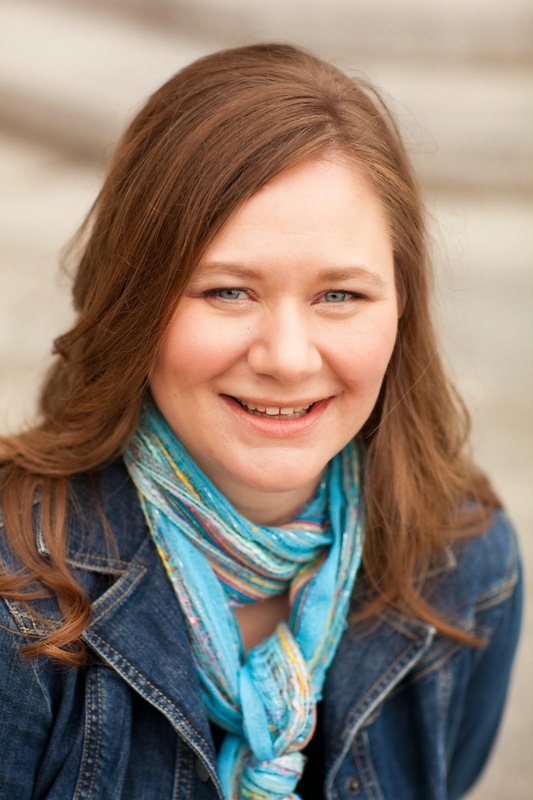 "Megan Shull described the setting really well because I felt like I was in the story. I could totally imagine where they would be. Once, when the two characters were switched and the boy was at soccer practice with the girls' team, I could imagine being on the field practicing." "Oh, and I remember how they were at the swimming pool in the very beginning and Ellie's friend was so mean to her." 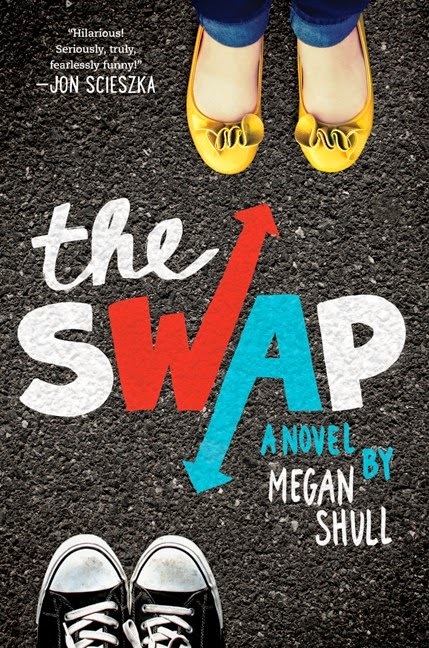 "The Swap was awesome! The characters were super strong. I could feel that they were actually real people.... The girl was being bullied but when she switches bodies with a boy, he helps her with it." It was interesting how none of the kids found it difficult to keep track of which character was talking -- they could really feel and understand the nuances in the characterization. I saw the ending as a bit too predictable, but my students focused on the emotional journey and resolution for the two main characters. "The author did a good job making sure there was friendship and some sadness, weaving in different kinds of stories so different kinds of readers would like it." As I think back on The Witch's Boy, I think that this is certainly a book that would benefit from another rereading. I could tell that students responded to the themes of courage, justice and inner-strength, but we didn't have enough time to really talk fully about these. 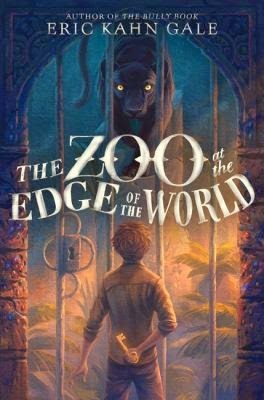 Our 4th graders were especially excited to recommend The Zoo at the Edge of the World to one another. "If you like animals, you'll love this book," said Claire in her nomination. I was happy to include an action-packed adventure in our selection. However, students did not end up citing it during our final discussions. Students like the development of Marlin's character, as he discovered his ability to speak directly with the animals even though he stuttered so badly that he couldn't speak to other people. I was concerned by the characterizations of the zoo employees who were native to British Guiana. They were never fully developed, but rather used as a contrast to Marlin and his father. I think students really responded to Gale's exploration of treatment of animals in captivity. The review copies came from our school library and my personal collection. Review copies were also kindly sent by HarperCollins. If you make a purchase using the Amazon links on this site, a small portion goes to Great Kid Books. Thank you for your support. 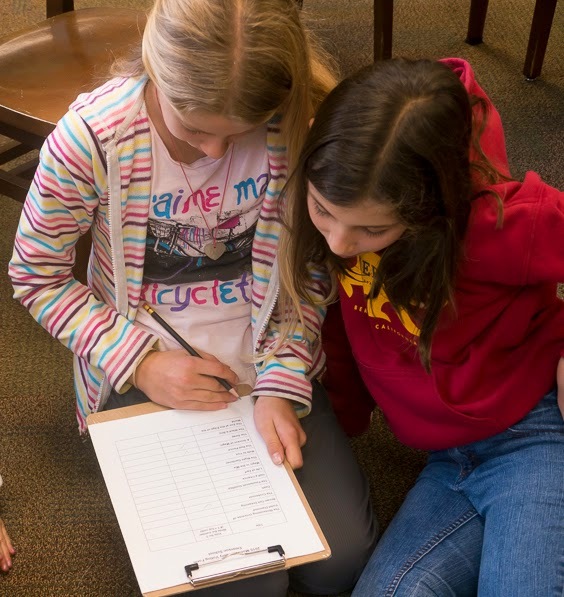 In our Mock Newbery book club, students were able to choose which books they wanted to read. In order to vote, they had to read five or more of the nominated titles. I wanted to give them freedom to choose what to read, but I also really enjoyed listening to them recommend titles to one another. We had informal book club meetings once a week for lunch in the library, and then we met in January for our final discussions. Many students chose to read today's three books--I hope I can capture some of their comments. Some students had trouble getting into this story and found the tone or perspective confusing. Maisy said at one meeting that she was half-way through the story and didn't quite see what's funny about it yet. McKenna told her that it starts getting funnier and funnier as you start getting more into the book--in fact, she wondered if it would be funnier the second time you read it. Talia and Gwen definitely agreed with McKenna. 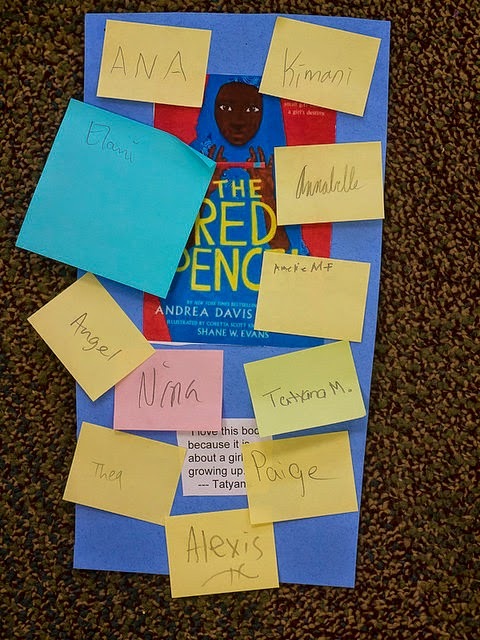 Students consistently mentioned The Red Pencil not only as a powerful, touching book, but also one that they could really understand what the characters were going through even though it was so different from their lives. When the Sudanese rebels attack her village, young Amira's home is destroyed and her whole life is upended. She escapes to a refugee camp, but what about her dreams of going to school? I just went back and checked -- it's fascinating that Pinkney writes this in the present tense. Amira's emotional journey was important to students. She had to escape her war-torn home, and she also had to discover how to navigate following her own dream of learning to read and write despite her mother's traditional views. 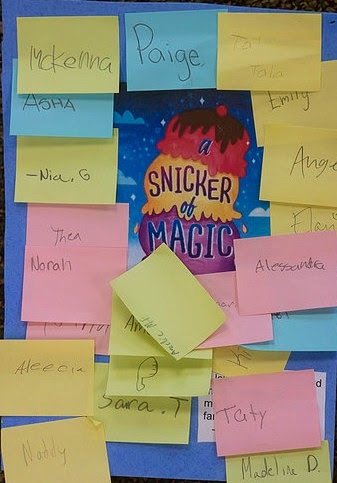 Just look at all those post-it notes--so many kids read Snicker of Magic. We all agreed that kids liked it, but during our Mock Newbery discussions we tried to explore why the story and writing were especially good. When Felicity Pickle moves to Midnight Gulch, Tennessee, our readers could tell right away that she was lonely--but Nia's comment to book club back in October was: "She think the word lonely is really really strong to say." Time and again, students mentioned how Felicity sees words, but they also noticed how the author really shows readers how Felicity feels. This magical element helped them see deeper into Felicity's feelings and Lloyd's themes. This mix of magical fantasy elements in a real-life setting appealed to many readers. They loved the details like blueberry ice cream that helps you remember lost memories, and they could relate to many of the characters. A few mentioned that the pacing seemed a bit uneven ("sometimes it speeded up and then other times it was really slow or went off into something that didn't go with the plot") but others strongly disagreed and liked the way different plot elements wove together. In our discussions we didn't have enough time to explore the themes of the stories, but I firmly believe that those underlying themes are a major reason why these different stories all appealed to readers. 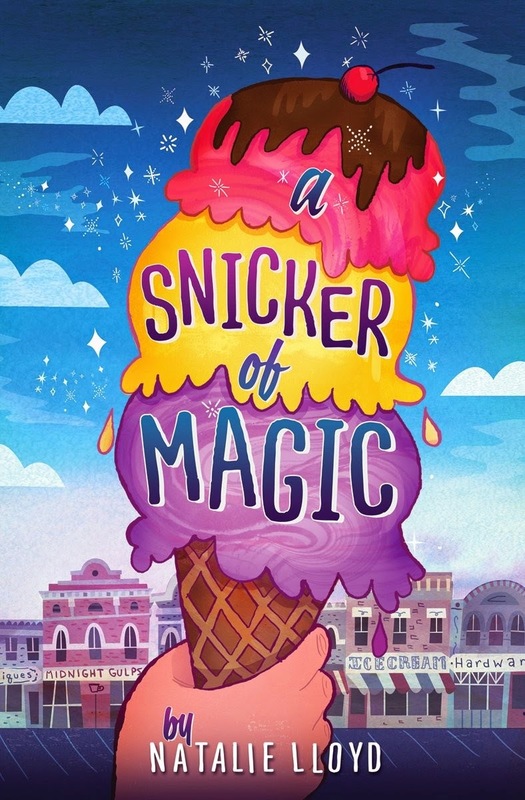 Whether it's TsTs' loyal friendship in Nuts to You, Amira's resiliency in The Red Pencil or the Beedle's generosity in Snicker of Magic, each of these deeper themes resonated with readers in lasting ways. The review copies came from my home collection and our library collection. Early review copies were also kindly sent by the publishers, HarperCollins, Little Brown and Scholastic. If you make a purchase using the Amazon links on this site, a small portion goes to Great Kid Books. Thank you for your support. What draws us into great stories? Is it the chance to see a glimpse of ourselves in other people? Is it getting lost in another world, so far from our own? Or maybe it's getting swept away by an exciting plot, full of suspense and danger. 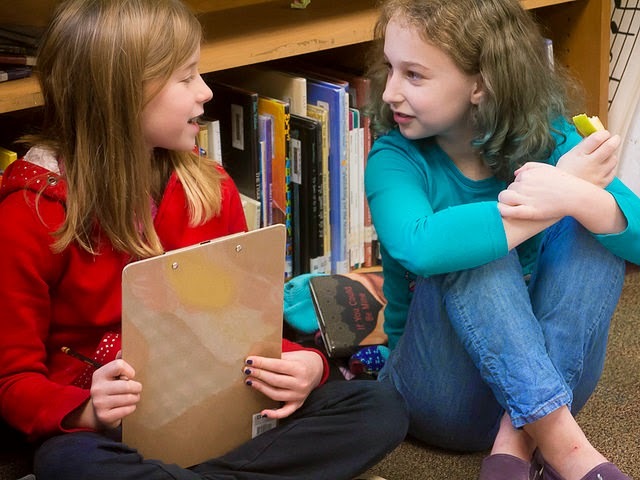 As we met each week, I loved listening to my students recommending books to one another each week during our book club lunches, hearing what they loved and what captured their interest. Many kids are drawn to stories with characters that inspire them because of their courage and bravery. Molly and Miri return from The Magic Half, but they are the only ones in their family who know that they haven't always been twin sisters. Molly and Miri's brothers always annoy them, but when the brothers stumble through the time portal that Molly and Miri have opened, the twin sisters know that it's up to them to rescue their brothers. 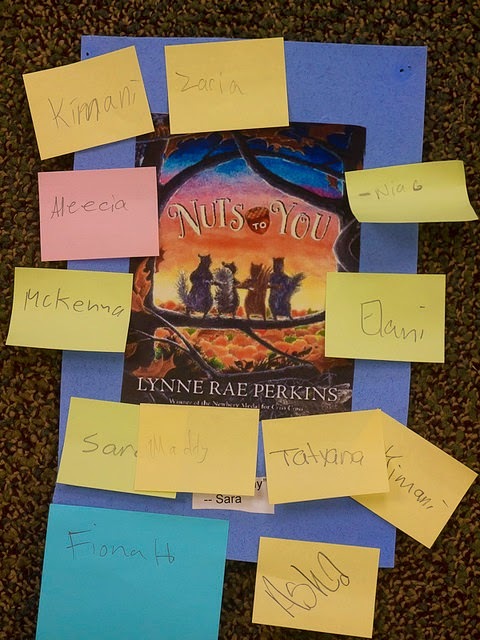 Our 4th and 5th graders all commented about how much they could imagine these characters, how the story pulled them through, and how they liked the mix of time-travel fantasy and historical fiction. "I liked learning a little bit about the Civil War, but not too much." "I could really see Molly and Miri and how brave they were helping their brothers." "When they were scared, walking through the forest, I could feel like I was right there." 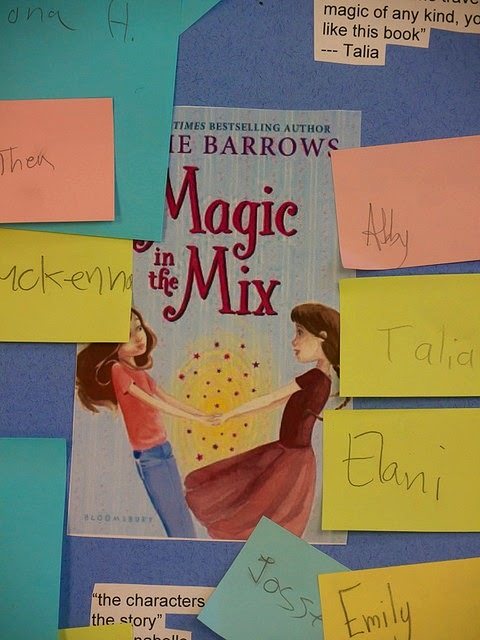 In the end, Magic in the Mix was read and enjoyed by many students (our two copies have circulated 25 times already! ), but it didn't rise to the top of many final voting lists. "It's not a happily ever book, but it shows how much a girl and her family care and love each other after various tragedies.They may not end up with a perfect life but I found it was even better that way." Nest is suited for students who like heartfelt stories that linger with you. Some students who like realistic fiction could tell that it was too sad, and stopped reading. 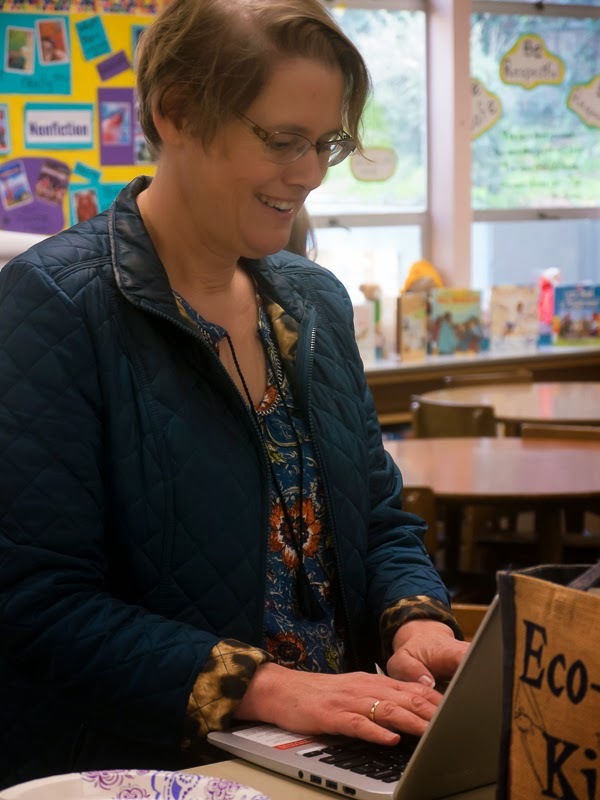 Speaking with middle school librarians, it's finding a wider audience there. This is definitely a story that makes readers think long after they've turned the last page. What I loved about my students' reactions is how much they related to Chirp's inner strength as she copes with her mother's illness. Students who read The Night Gardener held it up as an example for masterful plot, setting and character development. "I could see how the tree was built right into the house," said Amelie. "I really imagine the house, seeing how it was old now, but also how it used to be." The setting was integral to creating the frightening tone for the story, especially the suspense that kept students reading. Kaiyah specifically mentioned that she felt right in the forest when Molly and Kip were in their wagon heading toward the Windsor's estate. 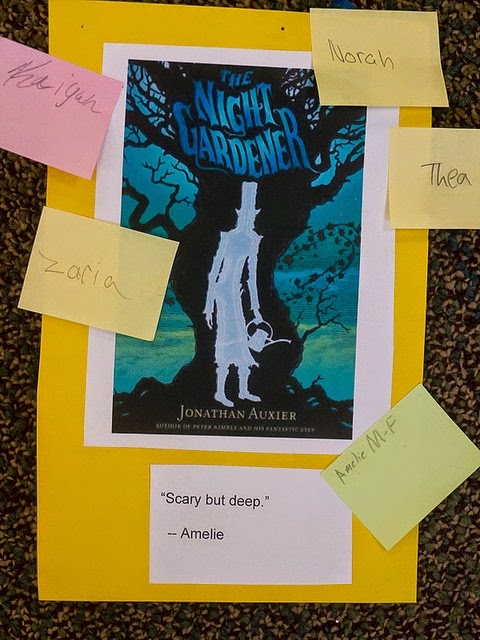 It's interesting -- I think both The Night Gardener and Nest might be seen as "more appropriate" for middle school students, but are ones that my students advocated strongly for including in our library. They are both emotionally intense stories, but I've found that students will stop reading them if they aren't ready for them. Both have depths in their treatment of different themes that I would love to talk more about with small groups, and both would stand up well to rereading. I was very happy to see both of these excellent books part of our discussion. The review copies came from my home collection and our library collection. Early review copies were also kindly sent by the publishers, Abrams and Bloomsbury. If you make a purchase using the Amazon links on this site, a small portion goes to Great Kid Books. Thank you for your support. Like the Newbery Committee, our students have been reading and reading over many months. Some books created a strong initial impression, but they did not stay with readers the same way as other books. What does that say about a book? Is it less distinguished? Maybe or maybe not. These three books below had fewer readers that championed these books in our final discussion. Students liked this complex, engaging plot as they followed Jackson Greene's efforts to help Gabriela win the student council election. Thea wrote when she nominated it, "This book is good because it felt like you were there with the characters. I couldn't put it down." I really enjoyed the twists and turns in the story when I read this. But I did find the way it started right in the middle of the action--with a big cast of characters--a little confusing. I kept wishing there was a cast list! This is a great story for kids who like thinking how all the pieces of a puzzle fit together. Although we had two copies at school all fall, not many students picked it up. At first, I thought it might be more suited to middle school, but it isn't circulating very much at our neighboring middle school. It will be interesting to see how this does over time. Cynthia Lord's Half a Chance is as different as can be than The Great Greene Heist. While the former is sharp and witty, Half a Chance is quiet and reflective. Since our students picked which books they wanted to read and didn't read all of our nominated titles, these two books drew very different readers. 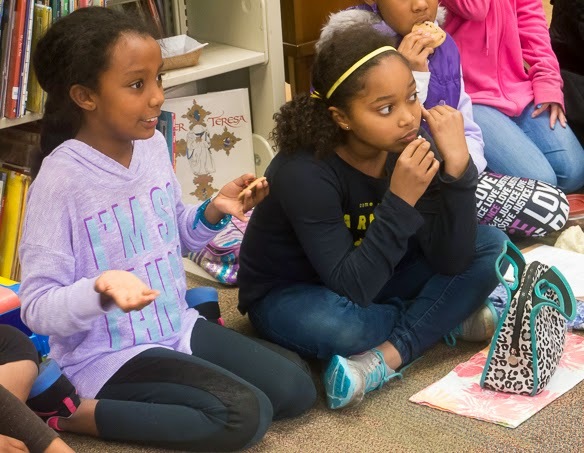 One of the interesting things about the Newbery committee members is that they read everything and they need to consider a wide range of readers. This friendship story appealed to readers who enjoy quieter stories with a lot of heart. Gwen nominated it, saying it had a unique style and felt very special. The rural New Hampshire setting was very different for our urban readers, and Cynthia Lord's language & tone created a timeless feel. Readers noted that it didn't seem like the 21st century--a big contrast to The Crossover and The Swap. As we discussed setting, Gwen noted that the setting was "quiet but beautiful"-- and that the setting really helped develop the whole feeling for the book. The characters were reserved, and I'm not sure if my students really understood the full scope of the story. If we had more time, I'd love to draw the students who read it together and ask them more about the grandmother's dementia. 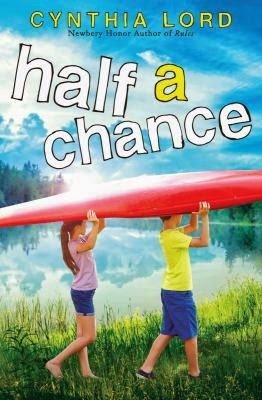 Where Half a Chance is quiet and reflective, The Life of Zarf is funny and zany. The students who loved this book were so excited that they convinced lots of friends to read it. It definitely had "book buzz" throughout the fall. But I'm not sure many readers considered it their top book by the end of the year. 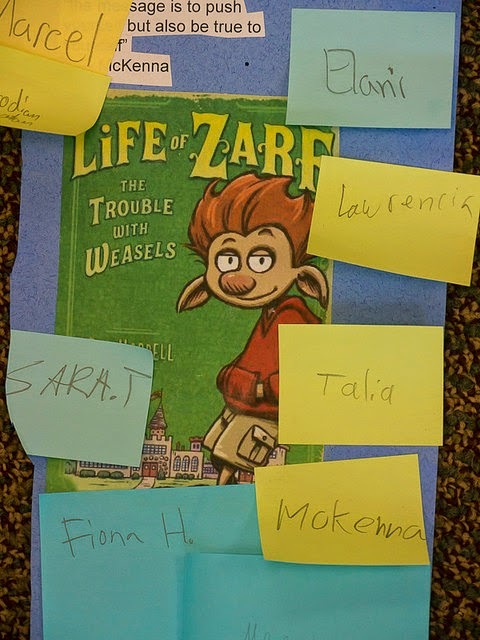 Our students laughed and laughed at Zarf's attempts to deal with middle school social structure, albeit in a mixed up fairy-tale world with princes, trolls and neurotic pigs. Like many kids, Zarf is goofy and funny -- it was a joy for them to read. Over and over again, kids ask me for funny books and this is a great one to hand them. "One exciting part that ended up funny is when Chester (Zarf's friend, the neurotic pig) is walking and a branch hit him. He thought it was a Snufflewheezle and he started freaking out. Then Zarf and Kevin Littlepig who were with him started freaking out too." 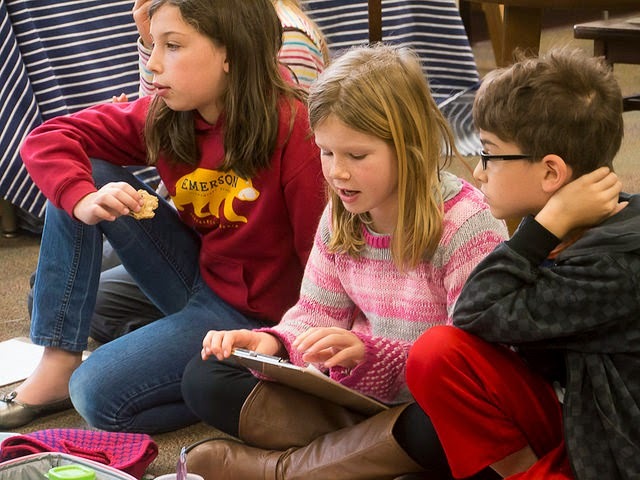 Just like the Oscars, the Newbery goes to "serious" books much more often than funny books -- even though slapstick humor is just as difficult to write well. I think it's because taste in humor is much more individual and varied. I didn't respond to the themes quite the same way that the kids did, probably because the humor seemed too exaggerated for my tastes. But if you know a kid who wants a fast-paced, funny story, definitely seek this out. The review copies came from my home collection and our library collection and our classroom collections. Early review copies were also kindly sent by Scholastic. If you make a purchase using the Amazon links on this site, a small portion goes to Great Kid Books. Thank you for your support. Our students have had passionate, thoughtful conversations all year, recommending books to one another, considering which book they liked and why it resonated with them. Throughout, we talked about the key components of literature and storytelling: character development, plot and pacing, setting, language and themes. 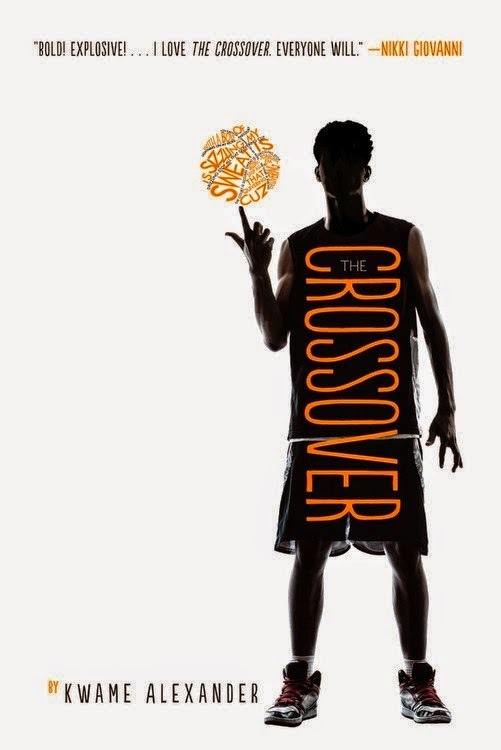 Ever since I first shared Kwame Alexander's The Crossover with Emerson students, it was clear that this book spoke to our students in a unique way. It's been fascinating listening to kids talk about why. From the very first page, the language of The Crossover pulls young readers right into the rhythm and feelings of a fast-moving basketball game. Just look at the opening lines and you can see the combination of basketball terms, rhythm and rhyme, and downright attitude. As Norah said, "It's not quite rhyming, but it's almost like rap, like a song." 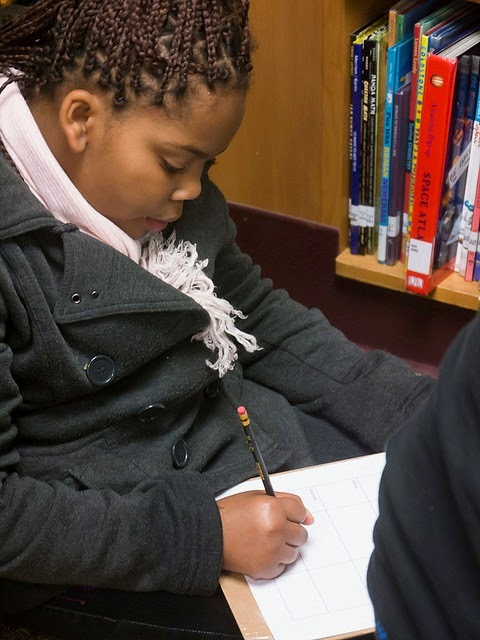 Mahari added that he likes the form of poetry: "It made it more interesting for me as a reader. The language conveyed the character's feelings." Norah added that it isn't just printed normal on the page. Kids really noticed that the way the words are arranged enhanced the way language conveyed both character's feelings and the author's message. Other students commented on the character development in The Crossover. Maddy said that she "felt like she was there with the characters at every move" (that word choice seemed so appropriate to me, since there's so much movement in this story). Kids could really see twin brothers Josh & J.B. as distinct characters and relate to the tension between them. Madeline added that she felt their father was a very detailed character, because Alexander showed how much he loved basketball but how he also really loved his family. I asked students if they felt that they could see what was coming (in other words, was the plot too obvious? ), and they really felt like they were right there with the characters. While some might have had an idea of the foreshadowing, they really didn't notice the signs that the mother was concerned about the father's health -- certainly not the way adult readers would notice. Several students commented on how The Crossover made them think a little more about what they were reading. They liked how the titles of the poems related to the themes and the plot--giving them a sense and focus. Several other students talked about how they had to take a second, reread a passage and ask what the author was really saying. I think this attests to Alexander's nuanced, layered language. 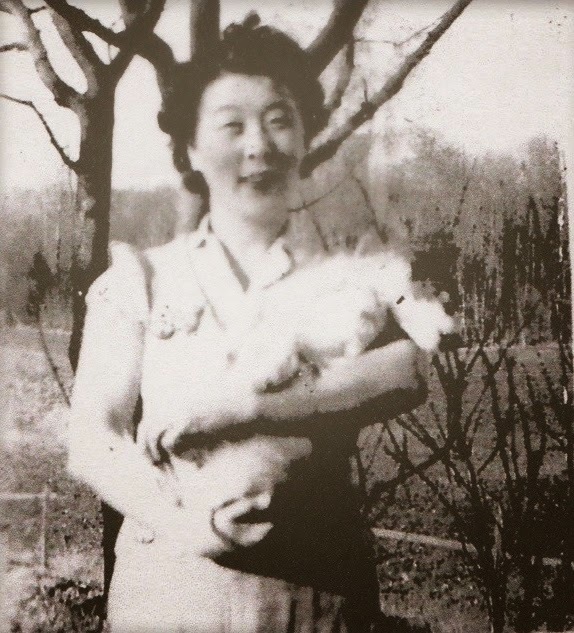 Historical fiction often draws the attention of the Newbery committee, and I was happy to see students respond so passionately to Kirby Larson's story about Japanese internment during World War II. 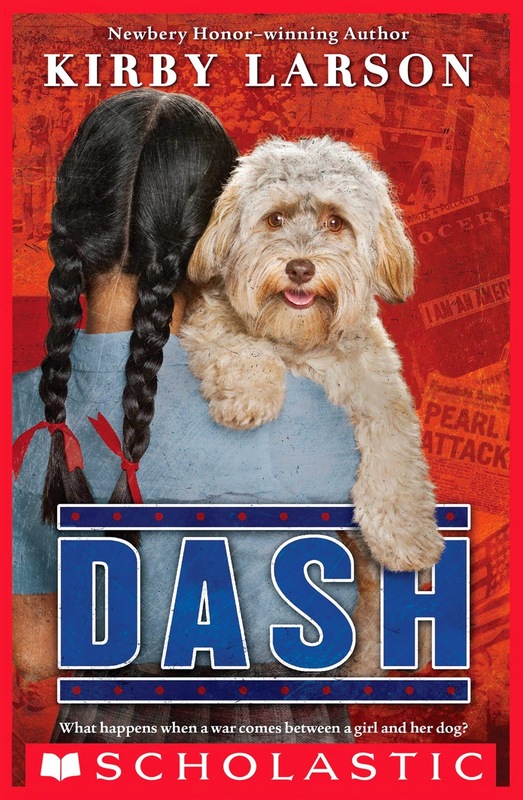 "Dash is one of the best books I have ever read!" Here's Abby's recommendation from early September: "If you like dogs a lot, you'd probably love it. If you like books with hardship and struggle, you'll probably like it. It's also heartfelt, with a lot of love. Every single chapter keeps you hanging." She passionately shared this book all year long. Right from the beginning, young readers relate to how alone Mitsi feels when her friends start avoiding her -- all because of something that happened in a war far, far away. Larson creates a unique, distinctive character, but focuses on elements that many readers can relate to. Just as I write that sense, I realize what a tricky balance that is! "The author describes Mitsi's emotions so well, her love of being an artists and her talents and passion. She brings out who she is and who she wants to be. I could imagine what she looks like and what she's feeling at the moment." Abby said, "The setting and details of the characters and their experiences were amazing. I could picture it like a movie in my mind---they should make a movie of it!" I would agree with Abby, especially noting the way I could picture the different camps in my mind and how the harsh conditions made life so much more difficult for Mitsi's family. I read DASH and poured over every sentence inasmuch as I was 16 when we were incarcerated on May, 1942. My family was assigned to Area D inside the Puyallup Fairgrounds, where our barrack among others was built inside the racing grounds. I don't know who guided you through the whole incarceration, but you did an excellent job of describing the experiences for someone like me. I also relocated to Chicago and eventually returned to Seattle, so again, your description of the whole movement brought back many memories. Thank you for your accurate descriptions of our experience to give the general public an insight into what we experienced during our incarceration. 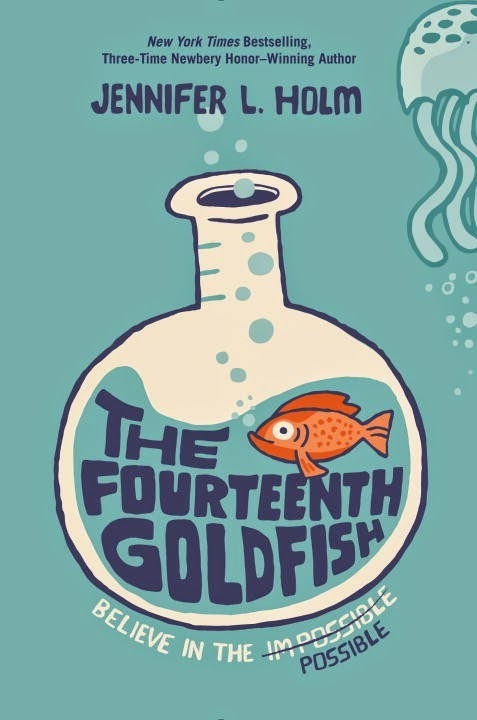 We had a rousing discussion about The Fourteenth Goldfish, with students arguing on both sides of the fence. It had real supporters and others who just weren't drawn into it. 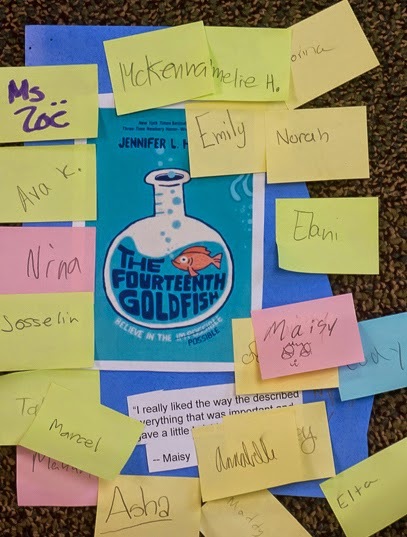 Overall, my students loved Jennifer Holm's blend of realistic relationships, humor and science with a touch of fantasy. Maisy said, "It's a really good book because it has lots of science, but not too much so you can't understand it." I am impressed with how well Holm understands her audience, adding in just enough layering of science to introduce students to the history of science and scientific thinking without overwhelming young readers. Some students really enjoyed the fantasy elements. Talia noted that it reminded her of Tuck Everlasting. But other students found it a little confusing, especially at the beginning when Ellie is figuring out that this teenager is actually her grandfather. I would actually venture to guess that the students who liked it were drawn in by the themes of the story -- the idea that you can figure out a solution, that things are possible if you work at a creative solution, and the idea that grandparents and grandchildren actually have a lot more in common if they could only discover a little more about each other as real people. The review copies came from my home collection and our library collection and our classroom collections. Early review copies were also kindly sent by the publishers: Houghton Mifflin Harcourt, Scholastic, and Random House. If you make a purchase using the Amazon links on this site, a small portion goes to Great Kid Books. Thank you for your support. Our 4th and 5th graders are buzzing with excitement from our Mock Newbery discussion and voting. We have been reading and reading, sharing books and ideas, trying to figure out what makes a book truly distinguished. 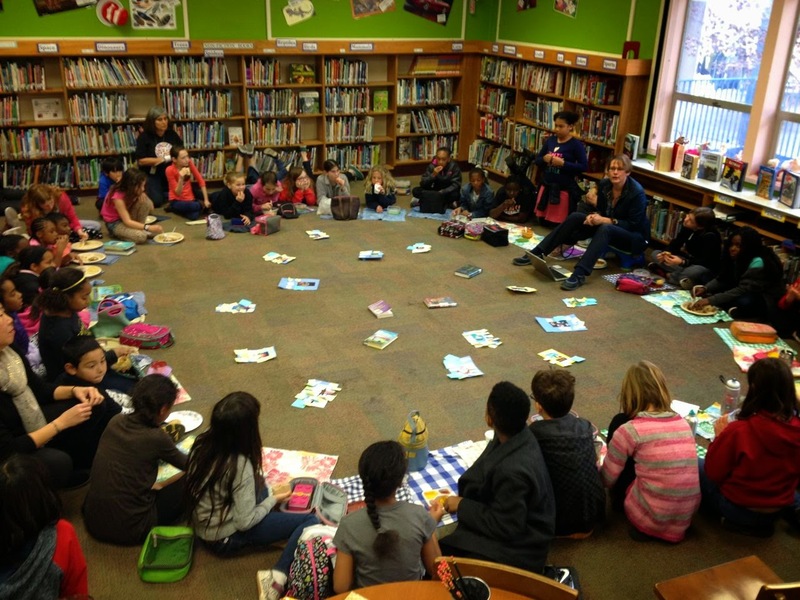 This past week, we've had two lunchtime book club meetings for our final discussions and voting. Just look at our turnout! Over the next several days, I will try to share my students' thoughts on our books. Each student has tried to read at least five books from our nominated books (see here for more about our process), and all were working hard to compare very different books with each other. I want other librarians, parents and kids to be able to hear some of their comments. There is no way that our small group could read all the books that the Newbery Committee will be discussing. I wanted a representative sample that fell within our 4th and 5th grader's range. This year, I also wanted to give the students more responsibility and voice in nominating books to consider. Part 7 -- OUR WINNER!!! Our book club actually start last spring, much like the Newbery Committee does, excitedly reading new releases. One of the first books that quickly grabbed readers and rose to the top was The Blossoming Universe of Violet Diamond. 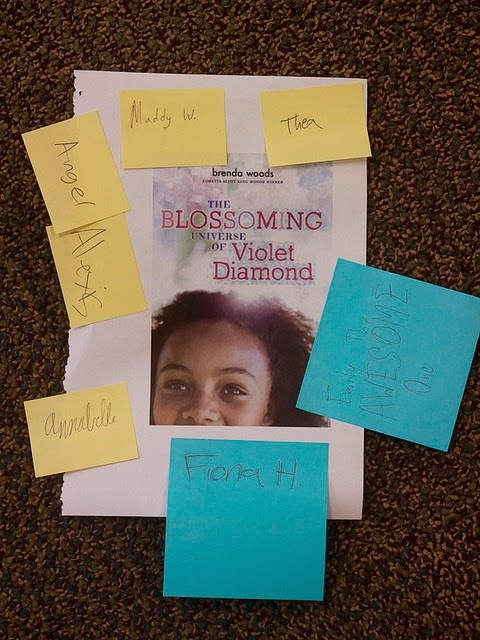 Emerson's fourth and fifth graders were drawn to the way that Violet Diamond slowly builds a relationship with her grandmother, and how she discovered more about herself, her family and her identity in the process. 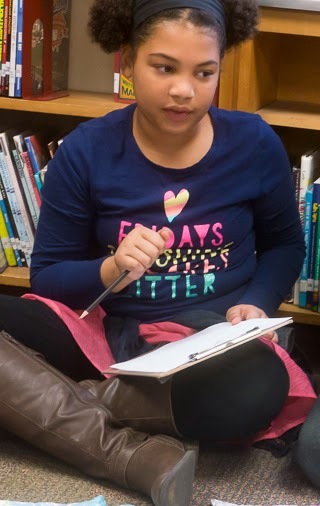 Violet is biracial, like many of our students; but she never knew her African American father because he was killed in an automobile crash before she was born. It was interesting that the students who really liked this book didn't speak up much about it. Perhaps it's because they read this in the beginning of the year. Or perhaps it's because it appealed to quieter readers. I just know that it stayed with my students, persisting to our final round of voting. 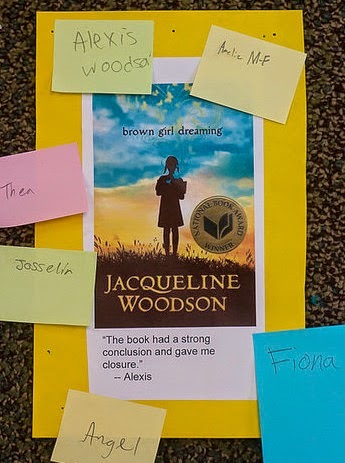 Brown Girl Dreaming was another book that probed identity, family and self-discovery -- but this book drew a much more vocal reaction from my students. Woodson weaves together the story of her childhood, built from her family's memories as well as her own. She writes her memoir in verse, capturing the episodic, sensory-rich feeling of memories. As we talked about characters, Kaiyah spoke up, saying how well she got to know the characters in Brown Girl Dreaming from the dialog. "In the first chapter, you can really understand what the dad was like and the mom, and the conflict between the two, because of how they wanted to name their daughter and how they talked." Other students agreed, saying how they got to know a wide range of characters, not just Jackie. Her brother and sister, her grandparents, her mother were all really well developed and distinct, showing you what different family members were thinking and feeling. "Jacqueline Woodson described her own experiences so well that I knew how she felt, and I have experienced some of the same things, so I felt like she would understand how I feel." Kaiyah and Angel also noted how well Brown Girl Dreaming captured the different settings, from rural South Carolina to urban New York City. Small interior images also stayed with our readers, like when Woodson's baby brother was eating paint chips from the wall. I was impressed how articulate and passionate our Brown Girl Dreaming readers were. While this isn't necessarily a book for a wide audience within a classroom, it goes deep for the readers it touches, staying with them for a long time. 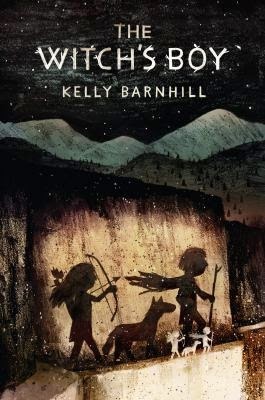 The review copies were kindly sent by the publisher Nancy Paulsen and Penguin Books for Young Readers, and we have purchased additional copies for our school library. If you make a purchase using the Amazon links on this site, a small portion goes to Great Kid Books. Thank you for your support. "Oh man, I love that book." -- that's Theo, one of my 5th graders, when I told them last week that we were going to Skype with Kwame Alexander, the author of The Crossover. How cool is that? Just hearing Theo sigh and declare his love for a book was enough to melt my heart. But now we are all soaring, with all the inspiration, smiles and love from our visit this week. 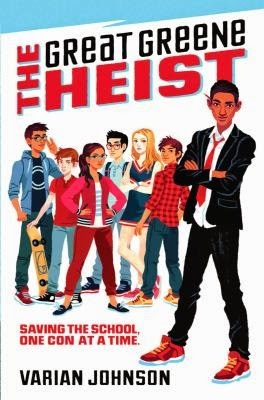 Huge thanks go out to Kwame Alexander -- first for writing a book with so much heart, so much swag, so much appeal that it's got kids passing it from friend to friend. But also for taking his time to visit with us. You can get a sense of what it's like for our students to Skype with Mr. Alexander in this picture below. 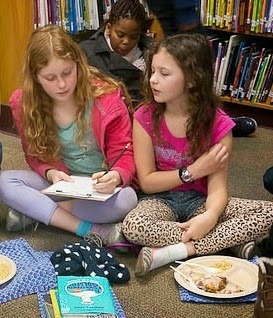 Two fifth grade classes gathered in the library (about 50 kids), of whom about 15 had already read The Crossover. We first listened to Kwame tell us about the book, but the bulk of our time was spent asking questions back and forth. As students started asking questions, I captured some of what Kwame was saying. I'd like to share a few excerpts here. "Basketball is like poetry in motion." "I was inspired to write this book by my relationship with dad. He was a really good basketball player, like Josh & JB's father, but I wasn't. I played tennis instead. I also wanted to this because I love basketball so much. And I wanted to write a book that boys (and girls too) would really want to read, and I knew that basketball would draw a lot of kids in." "Why did you write this story as a novel in verse? Because poetry is the coolest form of writing on the planet, and I happen to be the coolest dude on the planet! But it's more than that -- poetry is rhythmic and concise, and when you do it write, poetry has a lot of swag. This is just like basketball -- players have rhythm, movement, a lot of swag. A novel in verse also doesn't have a lot of words on a page, so kids who don't like to read won't be intimidated by this book. That was important to me." One student asked what the first novel in verse was that he read, and Kwame talked about how Love That Dog by Sharon Creech was just amazing. Then he asked her what other novel in verses she liked. When she told him that she loved Words With Wings, by Nikki Grimes, Kwame took out his phone and texted her! Then he took this selfie to show Nikki!! We asked him about what you do when you get stuck writing. Kwame asked if any of us played soccer. When you play soccer, you do a lot of running, but you aren’t always scoring goals. Writing is like that. You write and write and write, and eventually something will click and you’ll score. The Crossover took Kwame five years to write. Here’s how he goes about writing a poem. I make a list of as many words I can think of about that topic. I write down 30-50 words. I think about the structure -- what kind of poem am I going to write? Maybe I’m going to borrow a poem, model this poem on a poem I really like. Then I take my list of words and start fitting them into that structure. I add verbs or adjectives to link the words together, connect them, and keep playing. Special thanks to Kwame for taking time out of his writing day to visit with us. And special thanks also go to the Berkeley Public Schools Fund and our school PTA that made this visit possible. If you're at all inclined to try out Skyping with an author, reach out and see if they're interested. If I could, I would send every 5th grade teacher a copy of The Crossover. Not only can it capture kids' attention, but it holds them there with an emotionally resonant story told with powerful, crafted language. The review copy came from our school library. If you make a purchase using the Amazon links on this site, a small portion goes to Great Kid Books. Thank you for your support. Children are drawn to books in part to see themselves reflected, but also to look into the lives of other people far away. I think truly wonderful books can help us do both. 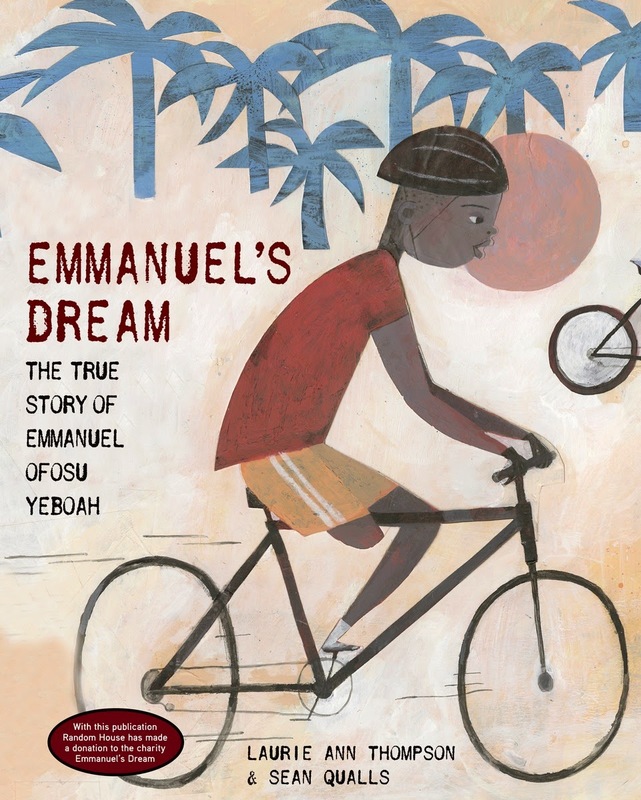 Emmanuel's Dream tells the inspiring story of Emmanuel Ofosu Yeboah, who was born in Ghana with one deformed leg. He faced life with courage and fortitude, and his story helps readers think about how we face life's challenges. From an early age, Emmanuel's mother encouraged him to go after what he wanted. Even though one of his legs was deformed, he hopped more than two miles each way, learned to play soccer, and even learned to ride a bike with his friends. In 2001, Emmanuel rode his bicycle four hundred miles across Ghana to spread his powerful message: disability is not inability. but he would have to get it for himself." Today, I have the honor of starting off a blog tour celebrating the publication of Emmanuel's Dream with an interview with Laurie Ann Thompson. Mary Ann: How did you first find out about this story? Laurie: I first learned about Emmanuel’s inspiring story when he appeared on the Oprah Winfrey Show in 2005 at the launch of Emmanuel’s Gift, a documentary about his life narrated by Oprah herself. On her show, Oprah said, “I think every parent should go take their children to see this movie because it will change the way your children think about what they can do and can be.” I agreed, but as a children’s book author I thought it would be even better if every parent could share Emmanuel’s story with their child through a book! Mary Ann: Then how did you go about learning more about Emmanuel? Laurie: First, I bought the movie and watched it over and over again. Then, I did research online and through library databases to find newspaper and magazine articles about Emmanuel and his activities. Finally, in 2010, I had the honor of meeting Emmanuel and interviewing him in person. After that meeting, I had 18 pages of typed, single-spaced notes to add to my research file! Since then, Emmanuel and I have kept in touch by email and phone, so he was able to answer all of my follow-up questions directly. Mary Ann: What was really interesting or surprising to you? 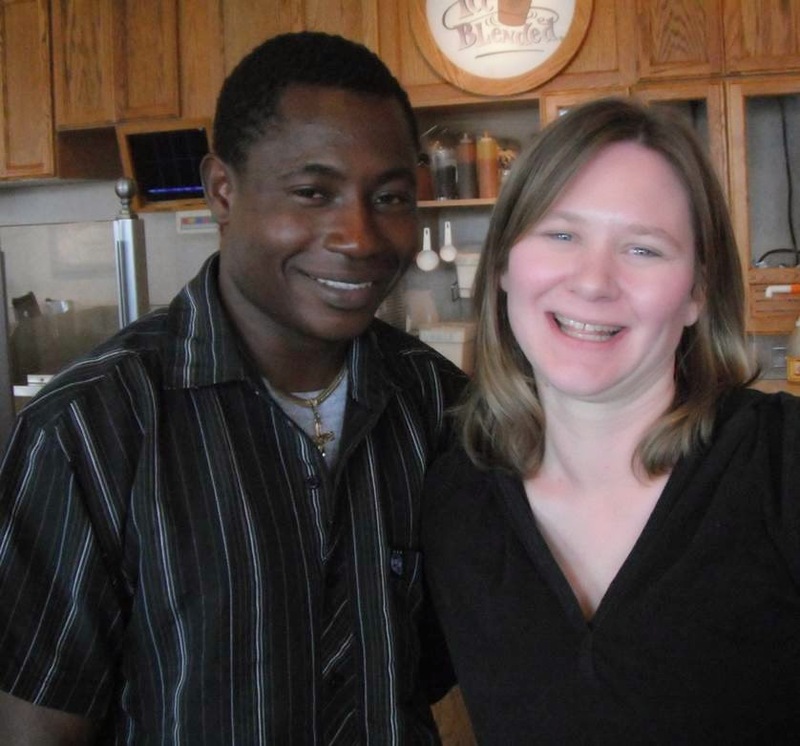 Laurie: What I love most about Emmanuel’s story is how thoughtful he was about what he was trying to accomplish. He’s an incredible athlete, yes, but he’s also very intelligent and observant, and his ride was more than just a physical pursuit. He specifically chose a sport, cycling, that most people think would require two legs. He hired a photographer to document his journey along the way. And he intentionally arranged meetings with key government officials and religious leaders all along his route so that his story would be featured in newspapers and magazines and on radio and television. This careful cultivation of the right kinds of media attention was a huge factor in his success. 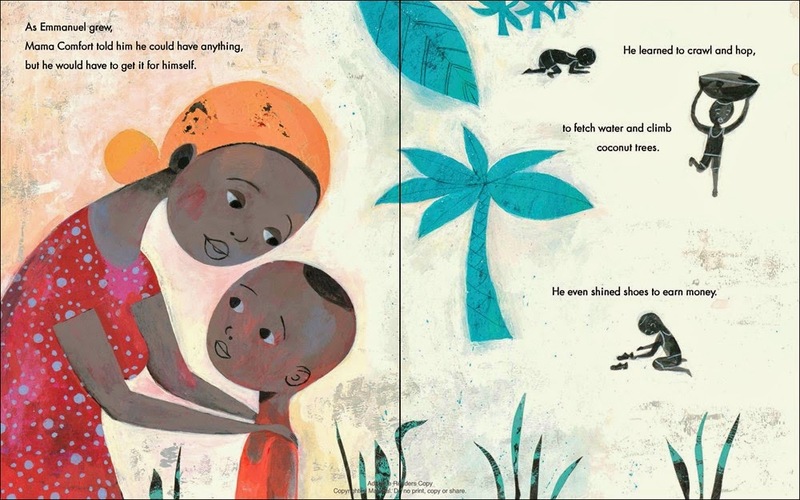 Mary Ann: When you read this story with children, what do you find they really connect to in Emmanuel's story? What inspires you about children's reactions? Laurie: Since it just came out, I actually haven’t had a chance to read it with very many children yet, but what attracted me to the story was the fact that Emmanuel was such an underdog. He wasn’t expected to do anything important with his life—he was expected to become a beggar. First, he ignored that expectation, and then he completely turned it on its head! The setting will certainly be unfamiliar to most readers in the United States, and many children won’t be able to relate to being disabled and but I think all of us, especially children, can relate to that feeling of being underappreciated, of someone else’s expectations for us coming in disappointingly, frustratingly low. I hope that after reading the book children will give themselves permission to follow their own dreams and live up to their own potentials, regardless of what others may tell them is possible or not. I think that’s the real power behind Emmanuel’s story, and what I most wanted to convey. Thank you so much, Laurie, for taking the time to share your thoughts on this beautiful story. I absolutely agree -- I think that this story helps children look inside themselves to see how they can be courageous, how they can live up to their potentials no matter what others tell them. I look forward to following all the stops on Laurie's blog tour. The review copy was kindly sent by the publisher Random House Books. If you make a purchase using the Amazon links on this site, a small portion goes to Great Kid Books. Thank you for your support. With so many tragedies in the news lately, I've been wondering what causes some people to react to life's hardships with hatred and bitterness when others react with empathy and understanding. 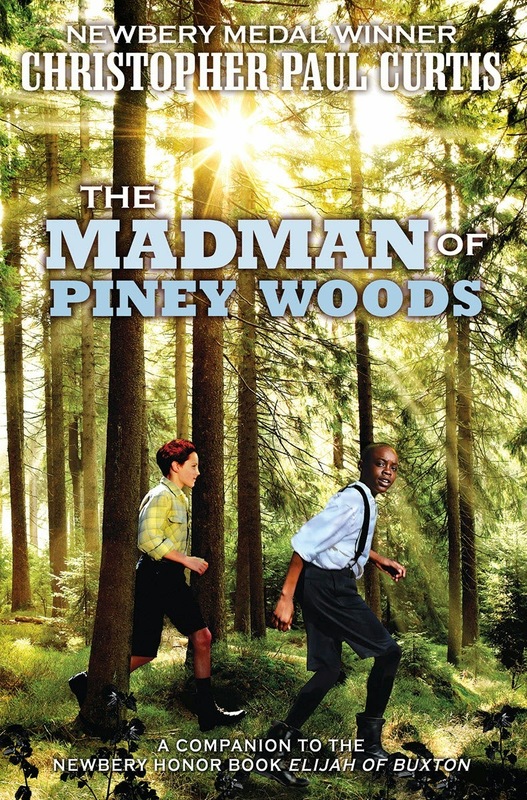 As I finished reading Christopher Paul Curtis's moving novel The Madman of Piney Woods, the characters gave me strength to face life's hardships and reflect on what's important. 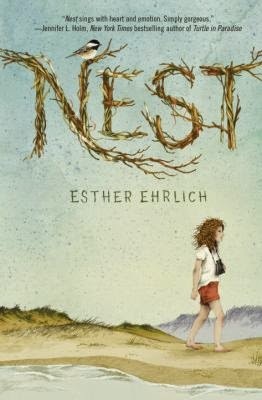 This is a companion novel to his Newbery Honor book Elijah of Buxton, but it easily stands alone. Thirteen year old Benji Alston lives in Buxton, Ontario and dreams of becoming a newspaper journalist. The Civil War happened long ago, but its impact still resonates in Buxton, a Canadian town settled by abolitionists and runaway slaves. African-Canadian Benji is excited to start an internship at a local newspaper in nearby Chatham, where he meets Alvin "Red" Stockard, son of an Irish immigrant and a local judge. Curtis slowly builds this story, immersing readers in each boy's separate life--showing their interactions with friends and family. African-Canandian Benji is most at home in the woods, but he is not a perfect character. He's exceedingly jealous of his younger brother and sister, teasing and tormenting them. Red is the sort of person who watches a situation closely, noticing how people act and interact. It's no surprise when we find out that he dreams of becoming a scientist. Both boys come across a man--perhaps real, perhaps mythical--living in the woods whom local children fear. Through Benji, readers comes to know The Madman of Piney Woods and learn about the horrors of the Civil War that made him retreat from society. But readers also come to know Red's Irish grandmother and the "coffin ships" that carried her to Canada--and how those experiences led her enduring bitterness. Benji has the last word with his first published article, a eulogy for Mr. Bixby which captures the lasting message I take away from this book. "He is a hero because, in spite of all the horrors he’d witnessed, he never allowed anger nor vengeance to poison his spirit. he is a hero because though surrounded by the ignorance of his fellow man, he never became bitter." I finished this book feeling like I was a better person for having read it. It reaffirmed my resolutions to keep connected to friends and family, to appreciate life's small moments and special people. My students love Christopher Paul Curtis's novels Bud, Not Buddy and The Watsons Go to Birmingham. It's interesting that few read Elijah of Buxton. I look forward to encouraging more to trust a favorite author and read this. It will be a perfect fit for students who seek poignant stories, appreciate masterful writing and enjoy becoming immersed in characters' lives. The review copy was kindly sent by the publisher Scholastic Press. If you make a purchase using the Amazon links on this site, a small portion goes to Great Kid Books. Thank you for your support.